I was working this week on a series of architectural photographs; shots of a newly refurbished tower block in Manchester. The project was to modernise completely and bring up to latest efficiency specifications a 1960s concrete tower, of the sort that has to an extent fallen into disrepute, due to structural and social problems. The building, 'Bickerdike Court', is in the area of the city known as Levenshulme, a few miles from the city centre, between the main A57 Hyde Road and the A6 Stockport Road, and close to Manchester’s well known entertainment complex, Bell Vue; once the site of a zoo, fairground, dog track and more. Even Levenshulme’s best friends would be hard pressed to say that it is a lovely area of opulence and opportunity, but like lots of Manchester, it has a certain character and, with a few parks, some pleasant green spaces. However, it is also a place where improvements are welcome. 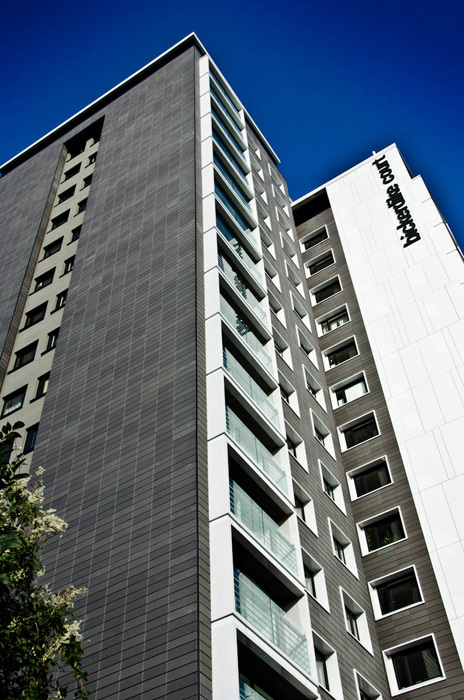 Amongst many improvements, the original beige-grey structure was covered with external wall insulation, to improve its thermal efficiency, and covered with cladding, both to encase the insulation and to change the building’s aesthetics. My client had the contract to supply window pods and balcony pods: polyester powder coated aluminium fabrications (the white boxes around the windows and balconies), which connect the cladding to the windows, cover old concrete surfaces and give the building much of its refreshed style. I think it is a major success. From looking like one of a million very tired 1960s utopian failures / brutalist edifices, it now looks like something beamed in from somewhere much more thrilling, sophisticated and exotic. The photograph shown here is one of many, taken from various distances and at many angles, to both give an overall sense of the impact of the building and show the architectural details that my clients need to highlight for their publicity material.